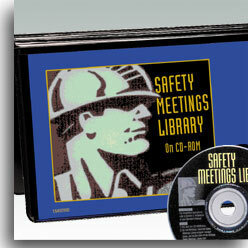 This easy-to-use CD-Rom gives you everything you need to prepare and deliver great safety meetings--in just minutes. Includes over 100 safety topics, along with prewritten outlines, handouts, quizzes, and more. Free quarterly updates first year. BLR-Business & Legal Reports, Inc., 141 Mill Rock Road East, Po Box 6001, Old Saybrook, CT 06475. Tel: 860-510-0100; Fax: 860-510-7223.